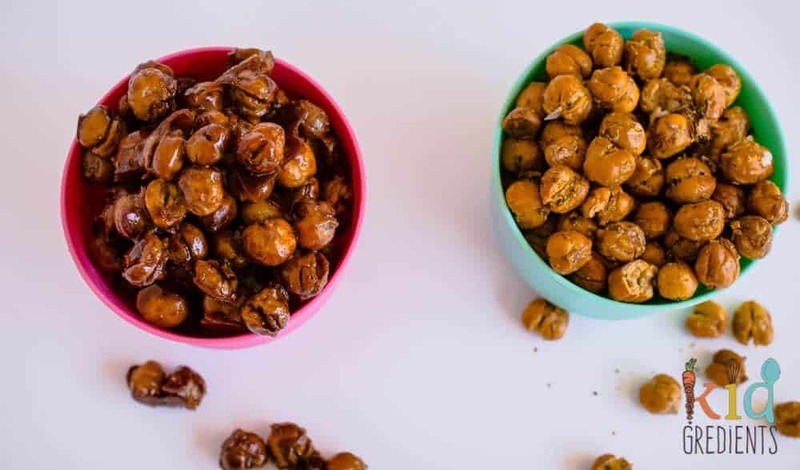 Like the sound of roasted chickpeas because they are healthier, super yummy and a perfect alternative to nuts that also packs a protein hit? 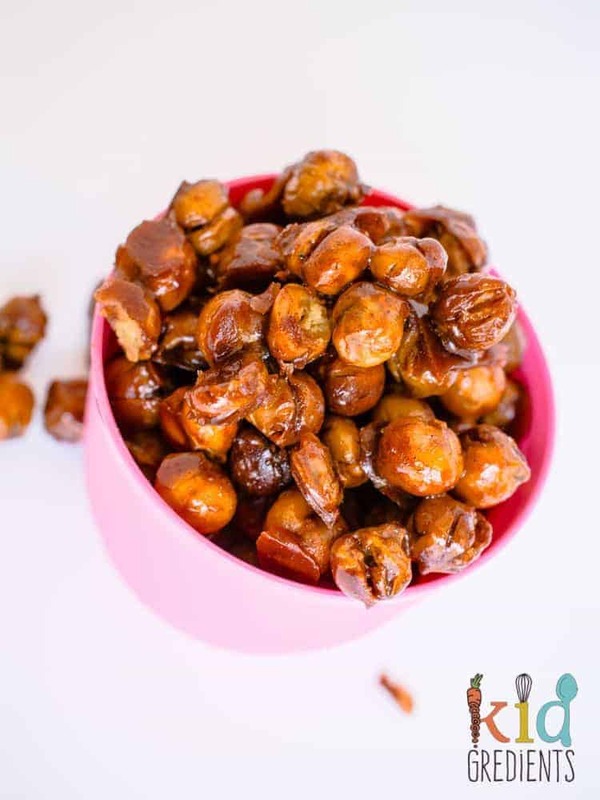 Well, then this recipe for cinnamon honey roasted chickpeas is the one for you. These are sweet, sticky and altogether delicious. So much so, that they are pretty much gone already and I only took the photos 20 minutes ago. The cinnamon and nutmeg work really well together to ground the honey and the salt helps to give a slated caramel taste to the chickpeas…and trust me that is always good! 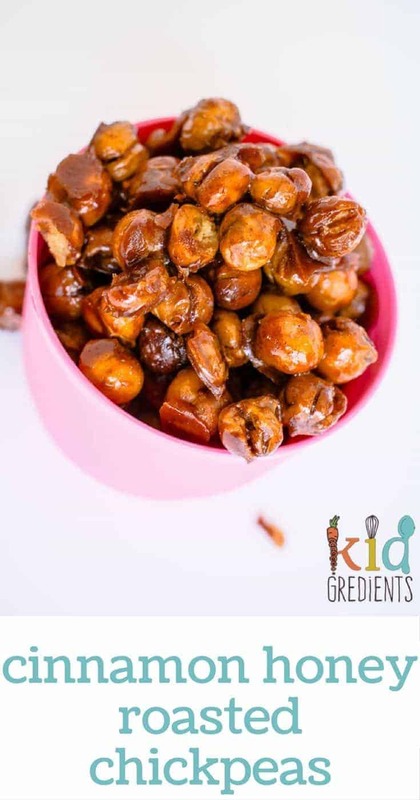 These cinnamon honey roasted chickpeas are so great the kids are major fans. If you’re looking to swap nuts for something crunchy and yummy, these should be your go to. 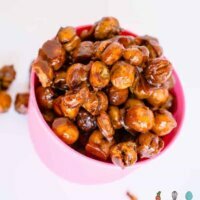 You can make them with dried or canned chickpeas, just follow this recipe if using dried. Then pop back here to follow the rest of this recipe. You could also use tinned chickpeas and immediately go with the recipe below. This makes it a lot quicker and easier and to be honest it doesn’t change the texture much. If you’d prefer savoury chickpeas, check out these herb and sea salt roasted chickpeas! 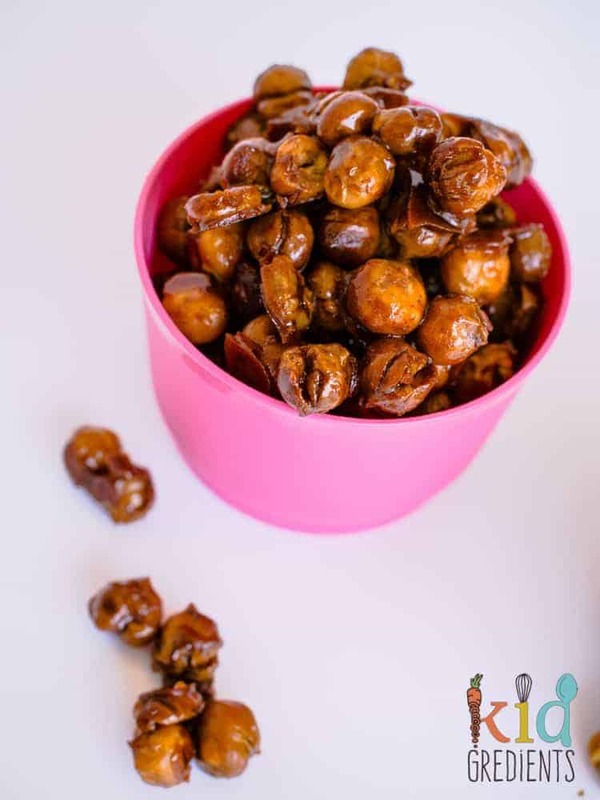 Cinnamon honey roasted chickpeas, perfect for the lunchbox and so very yummy, these cinnamon honey roasted chickpeas are great nut replacers! Rinse the chickpeas in a colander and pop off all the skins (if you want to- it does add to the texture to remove them). Lay them out in a single layer on a lined oven tray. Roast for 45 minutes or until dry (get one out and test it- it should crunch!). While they are roasting, combine the honey, coconut oil, cinnamon, nutmeg and salt flakes in a jug. Pour the hot chickpeas into a bowl ad pour over the contents of the jug. Stir until they are all coated. Pour back onto the baking tray and bake for another 10 minutes. Wait until completely cool before storing in an airtight container. My son is allergic to coconut (and all nuts). Can you recommend a substitute for the coconut oil? Coconut isn’t a nut, it’s officially a seed or drupe and doesn’t have any of the characteristics of nuts. but, if you need to sub it, swap it for another oil of your choice.